Posted June 23, 2015 by Heather Michet & filed under Crow Living, DIY, Drinking Water, Health Tips, Water. 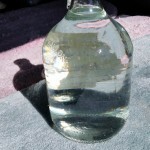 There is little regulation on its contents so virtually any “clear water” can be bottled and sold. For example, many bottled waters are municipal water that may have been marginally filtered. Toxic chemicals such as BPA and others leach out of the plastic bottle into the water, especially when bottles are exposed to heat or are stored over time. Many of these chemicals are known endocrine disruptors with many health concerns, including fertility and thyroid issues. 4 liters of water are required to make one liter of bottled water. This robs the planet, and therefore you, from precious potable water. Discarded plastic bottles are clogging our landfills, oceans and garbage cans. Sadly, only a small percentage are recycled. The land being hogged by this growing collection would serve much better as food-producing ground. It is ridiculously overpriced which pulls your income away from a true health-promoting purpose like a new bike, local organic food, or a great water filter! 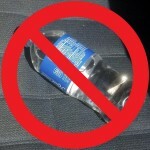 The worst thing you can do is drink bottled water that’s been sitting in a hot car! An easy and inexpensive solution is to purchase a gallon glass jug, typically used for apple cider. Enjoy the cider, then wash out the jug, fill it with filtered water and keep in your car. Make sure you secure it either in a spot where it won’t roll around in the car or wrap a towel around it to prevent breakage.